The San Diego 2-4 Units 2nd Quarter Report (Apr 1 – Jun 30, 2017) consists of the following data/charts. The most notable statistic from this quarter is the fact that prices settled from the first quarter to second. The first quarter’s results revealed an increase in total median price but a decrease in average pricing. This quarter, however, reveals a decrease in both median and average total prices. Although the 1st quarter to 2nd quarter prices showed a decrease in value, the year-to-date comparison from 2016 to 2017 is still positive overall. The price increase is also a sizable number at 9.02% median increase and 8.32% average. Although prices have settled from Q1 to Q2, properties still continue to sell at a faster rate, which is an interesting statistic. 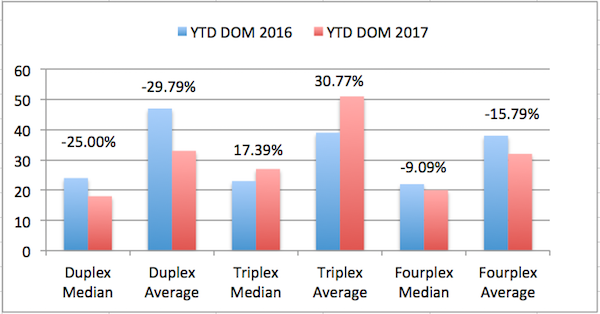 There was a 10% and 15% decrease in days-on-market in median and average DOM respectively. Comparing the length of time properties are selling in the same span of time from last year to this year, we see that there is a continued decrease. San Diego 2-4 units are continuing to sell at a faster rate. An interesting statistic to observe is the surge in transaction activity in this 2-4 unit segment from last quarter to this quarter. What makes this most interesting is that this increase in activity occurred while prices settled slightly. The combination of settling prices from Q1 to Q2, while still seeing properties sell at a faster rate and sales activity surge by 33.52% is in interesting scenario. Unlike last quarter, both median and average prices showed a slight decline. It’s too early to consider this the new trend in the market, but it’s interesting to see this statistic in pricing. The DOM and activity level are still indicative the the market is still strong. For further discussion or help with your next 2-4 unit purchase or sale, please don’t hesitate to call!